BriteWash is specifically-designed to work with both BritePlus MX metal cleaning products. And you can use it just like an everyday car, truck, trailer or equipment detergent concentrate. But it’s anything but normal. It’s the best general-purpose detergent concentrate we’ve ever tried. 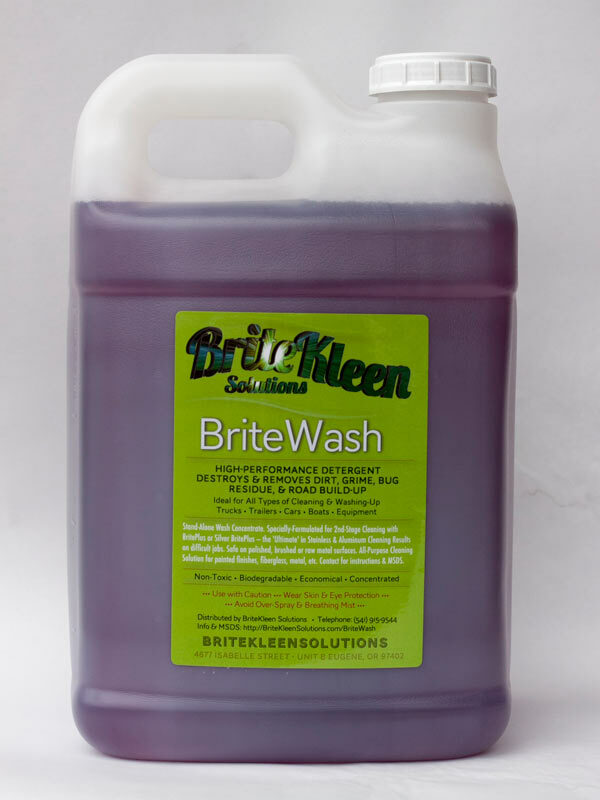 Used with either of our BritePlus MX cleaners—BriteWash becomes the essential step in a total BriteKleen Solution. While mixing on the surface with either of the acidic BritePlus products, BriteWash causes a special chemical reaction. This further dissolves, loosens, lifts and removes the most difficult stains. 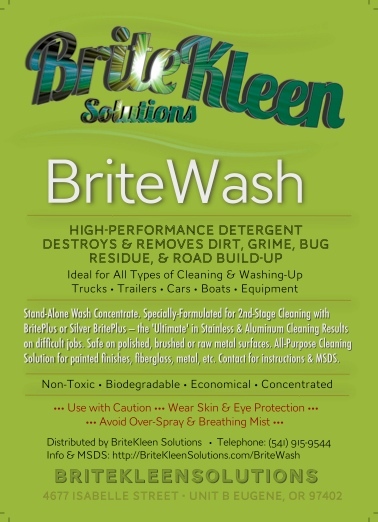 BriteWash is an acid-neutralizing second-stage cleaning booster. It goes on right while you’re cleaning with the BritePlus MX products. After you’ve agitated/brushed. Just before rinsing. Otherwise, the process is identical. One small sub-step before rinsing..
As a concentrate (1 cup to 3-5 gallons water) it’s economical. The combined results are amazing. The process is still the same. Apply. Agitate. Rinse. You add the additional step of dipping your brush into the BriteWash solution and scrub it right into the BritePlus product. Then rinse. You’re done. We honestly didn’t think you could improve Silver BritePlus MX and BritePlus MX…but the mad scientists behind BriteWash sure did! Another great thing about BriteWash is how well it works by itself. For bugs, baked-on dirt, dust, road grime and winter stains, its stands alone. Here in Oregon cars and trucks take a beating during the long, wet winters. Especially if you’re making trips over the Cascades where they put down volcanic cinders and gravel for traction. It’s like red cement dust that won’t come off. But it’s no match for BriteWash. Use it between applications of Silver BritePlus MX or BritePlus MX, just like a normal wash. It will extend the time between applications of Silver BritePlus MX and BritePlus MX and keep your car, truck or trailer looking new much longer. Bottom Line? BriteWash is designed to work in combination with BritePlus MX products — but it’s a remarkable product on it’s own. No matter how you use it, a little goes a long way. As a second stage cleaner, use just one cup per 5 gallon bucket (~2/3 full). Using it as stand-along wash, experiment to find the best cleaning power for your job. Normally 1-2 cups per 5 gallon bucket works GREAT! We are running special combo packages of BritePlus & SilverBrite Plus with BritePlus HERE.